Well, so much for February. The cat is still here. We have been distracted by life, blizzards, saucers of milk, new bedding, etc. But our lost causiness is very much intact, and The League has not been forgotten! In fact, a major design overhaul is in the works, so brace yourselves for that magnificence. In the meantime, I finally got around to updating the League Store, which now boasts 68 (!) bumper stickers and several long since requested items, including "Complimentary" cards and wearable reminders of lab safety. So if browsing is your thing, that should help pass the time. A surprising number of you requested a more overtly aggressive line of vehicular embellishments. Who am I to judge? I have obliged you thusly: Bumper Stickers for Conflict Seekers are now available. Display at your own risk. Has the fear of potentially inciting hostility been holding you back from the vehicular adornments for which you yearn? 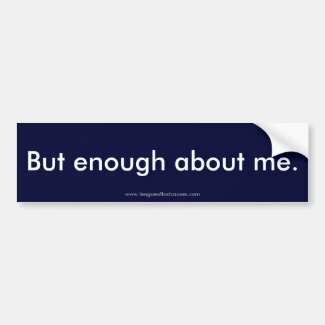 Stock up on Bumper Stickers for the Conflict-Averse and engage without enraging. Available now from the League Store.